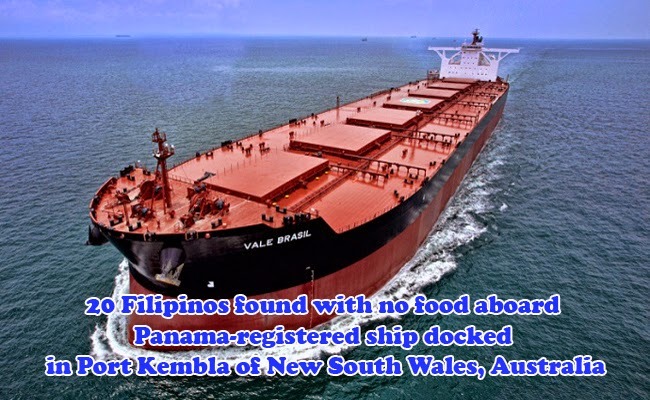 There were 20 Filipinos found with no food aboard Panama-registered ship docked in Port Kembla of New South Wales, Australia. The ship named Bulk Brasil had been detained by Australian Maritime Safety Authority on January 29, 2015. According to the National Co-ordinator Dean Summers of International Transport Workers’ Federation (ITF), the salaries of the seafarers found on board the ship was long due since September. He also shared how shocking it is to find out that ship’s operator, Japanese Company Keymax, had even signed an agreement with them to pay an international minimum standard but had not paid their seafarers for four months already. Summers also shared that the ships had greatly improved for the past 20 years, yet when it comes human element, the respect for the seafarers and their management had been very low. The Bulk Brasil was found full of Australian Cargo bound to United Kingdom. Summers further said that the seafarers needed back pay and the company which owns the cargo had to undergo investigation. He said that the Australian company which had the most gains in through its business of international sales of cargo must take the responsibility of making sure the seafarers were being paid what is due for them. Summers also shared that Japanese Company Keymax had been known for breaking the Maritime Labour Convention in twelve ports around the globe. The story of the 20 unpaid Filipinos onboard the Bulk Brasil is also not a new story. According to Reverend Canon Garry Dodd of National Executive Officer as reported by ABC News, the companies are willing to be charged with fines and get their ships detained to save more money. He called the situation as slavery of the modern day. International Transport Workers Union and AMSA were said to be going to get involved with the case.